An update on Santa Cruz Elementary School at Tortosa, plans for the new Villages elementary school and the renovation plan for Maricopa High School were presented to members of the governing board Wednesday night. David Bradley of D.L. Withers Construction announced that paving would begin at Tortosa on Thursday with landscape seeding to follow in May. Masonry and most of the roof are complete. The goal, according to Bradley, is to move in furniture in mid-July. Construction will begin on the new Villages elementary school site in September with completion set for July 2008. “This site lends itself to some real positive things,” said Don Brubaker, architect from Gilleland and Brubaker. He added that the state’s School Facilities Board has decided to provide more amenities for schools at all grade levels; thus Maricopa will, hopefully, be in line for several million dollars worth of improvements to new schools. One of those positives is having access to the site on all four sides, with the access on Honeycutt Road being exit only. Honeycutt is the southern border of the site while Butterfield Parkway lies directly to the north. Some of the other changes for this site, which utilizes the same basic layout as Maricopa Elementary at Alterra, are the absence of parallel parking, a separation of faculty parking from bus lanes and a kindergarten area built adjacent to the multi-purpose room. All playgrounds and fields are located to the side or back of the site for added safety and observation. In addition, students won’t need to traverse hallways since the multi-purpose room leads directly to the playgrounds and fields. The Villages elementary school will be a 76,000 square foot facility built for 850 students. McCarthy Construction will be responsible for the renovation of the high school site. Buildings scheduled for retention are the present cafeteria, library, multi-purpose room, gym, IT building, the elementary cafeteria presently used by Santa Cruz Elementary students and the classrooms directly west of the old middle school site. Phase one, “the biggest thing” according to Brubaker, will the working with sewer connections which run south to north to Taft. Some of them will have to be capped. Plans include relocating the baseball field, building storage and lockers at the football field, paving the parking lot adjacent to the football field and remodeling the library. Dollars and practicality can affect that,” explained Brubaker. He added that needed flexibility would come from vacated classrooms on the Santa Cruz Elementary campus, enabling the high school to move students while construction is under way. 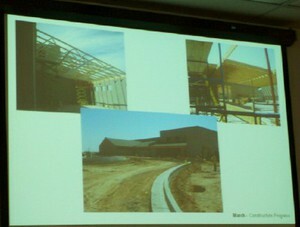 The first phase of the renovation is scheduled for this summer with a completion goal of 2009.